Transnistria, officially the Pridnestrovian Moldavian Republic (PMR), is a breakaway state in Eastern Europe that has remained in the shadows ever since its self-proclaimed independence as a Soviet republic in 1990 and subsequent breakaway from Moldova in 1992. Currently only recognized by Abkhazia, South Ossetia and Nagorno-Karabakh, which themselves are also unrecognised countries, Transnistria is situated in between the Ukraine and Moldova. Nonetheless, Transnistria functions as a de-facto state with its own army, air arm and even its own arms industry. It is the latter that has produced a number of very interesting designs that have entered service with Transnistria's armed forces over the past two decades. This industry was highly active during the Moldovan Civil War, producing a variety of DIY armoured fighting vehicles and homemade multiple rocket launchers (MRLs) for use against the Moldovan Army. 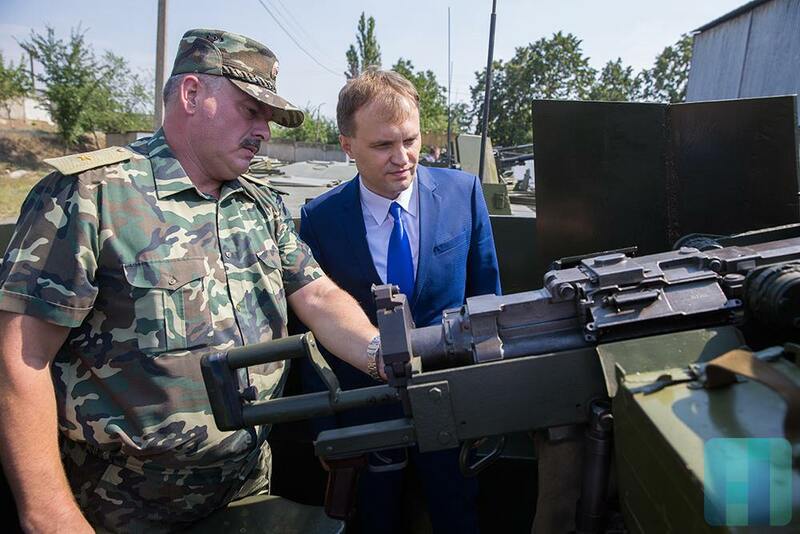 After the cessation of hostilities, the arms industry would play a vital role in upholding the operational status of the Transnistria's army, which has remained unable to replace its dated inventory of Soviet weaponry ever since its establishment in 1991. One of these designs is a unique armoured personnel carrier (APC) based on the Soviet GMZ-3 minelayer. First unveiled in 2015 by Transnistria's former president Yevgeny Shevchuk and Defense Minister Alexander Lukyanenko, at least eight of these vehicles are believed to have entered service with the Transnistrian army that year. At least two of these vehicles were seen participating in exercises just over a month later, confirming their operational status. Transnistria is notorious for its supposed role in arms trafficking throughout the region and farther abroad. Large quantities of weaponry and ammunition from the Soviet 14th Army were taken over by Transnistrian locals, elements of the 14th Army loyal to Transnistria and foreign fighters when Moldava entered what according to the Moldovan government was and still is Moldovan territory, resulting in conflict between the two in 1992. While large amounts of the missing weaponry and ammunition was subsequently secured, taken over by the newly established Transnistrian Army or transported back to Russia under the supervision of the Operational Group of Russian Forces in Moldova, limited quantities of weapons originating in Transnistria still found their way abroad. Nevertheless, its status as an arms trafficking country is certainly exaggerated. Despite having ended armed conflict in 1992, the situation in Transnistria remains extremely complicated, with the the breakaway state wishing to join the Russian Federation while continuing to remain heavily reliant on Moldova for exporting the limited produce its economy outputs. Despite making small steps towards increasing transparency to the outside world, Transnistria remains a Soviet Socialist Republic, as such continuing to make use of the hammer and sickle in its flag – even retaining the KGB as its main security agency. Russia still maintains a limited presence in Transnistria, its soldiers officially on a peacekeeping mission. When the Soviet Union dissolved, much of the personnel and their associated weaponry which once made up its military became subordinate to the newly established states they were located in. While this process was often troubled by the departure of many ethnic Russians stationed outside of the former Russian Soviet Federative Socialist Republic, this wasn't the only problem encountered in Moldova. The 14th Army was in fact stationed in the Ukraine, Moldova and the breakaway state of Transnistria, with various units of the 14th becoming subordinate to either the Ukraine, Moldova and Russia, or loyal to the newly formed Transnistrian republic. Obviously, this made for an extremely complicated and sensitive process. When Transnistria took over most of the weapon storage depots on the territory it controlled, it inherited large amounts of highly specialised vehicles while being left without any significant numbers of infantry fighting vehicles or self-propelled artillery. 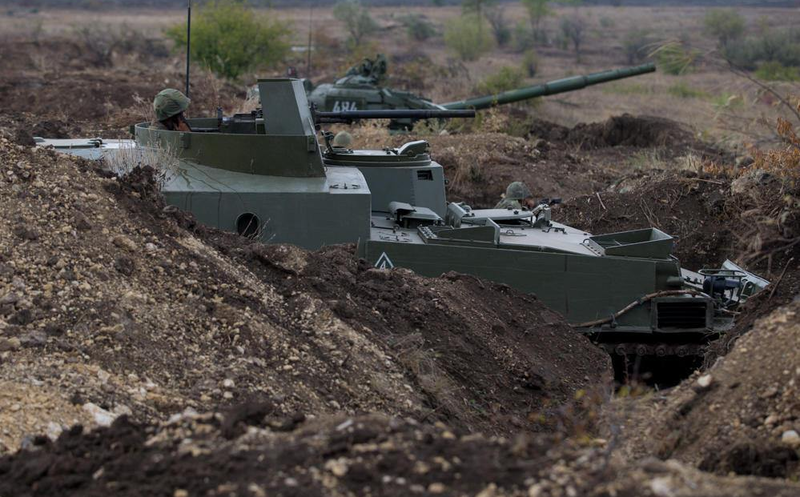 Indeed, apart from several 122mm 2S1 Gvozdikas and 152mm 2S3 Akatisyas that were present in this area (which in fact likely found their way to Russia), there is no self-propelled artillery in the inventory of the Transnistrian Army. Instead, it relies on an arsenal of towed field artillery and 122mm 'Pribor' MRLs for indirect fire support. The specialised vehicles Transnistria took over included a large number of GMZ-2 and GMZ-3 minelayers. Redundant in their original role during the Moldovan Civil War, several GMZs were employed as makeshift armoured personnel carriers by Transnistria, and at least one was subsequently destroyed in the fighting. 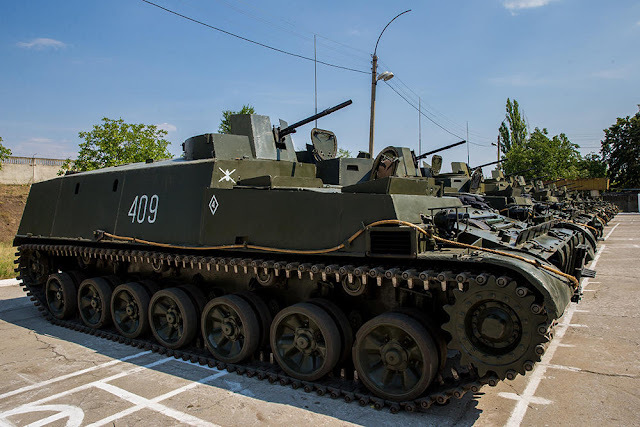 Transnistria would continue to make use of several GMZs in their original role after the war, but with no need for such a large fleet of minelayers, most vehicles were placed in storage until it was decided to convert at least eight GMZ-3s to armoured personnel carriers. Although the amount of GMZs available to Transnistria remains unknown, the number is likely insufficient for the conversion of much more GMZs to this role. In order to be capable of carrying infantry, all minelayer equipment was removed in line with its new role as armoured personnel carrier. The minelaying arm and the compartment for its operator were removed to make place for a door, while the space the mines were stored in was cleared and expanded to accommodate for the infantry compartment. The GMZ-3 in its original configuration can be seen here, a striking indicator of the transformation it has underwent. A clearing was created between the driver's seat and infantry compartment for a gunner position equipped with a single 14.5mm KPV heavy machine gun (HMG), which was extensively modified for easier handling by its operator. In addition to the single HMG, rifles and light machine guns can be fired out of the vehicle's five firing ports. It is unknown if this transformation effected the armour of the GMZ-3, which was originally protected against small-arms fire and explosive fragments. For Transnistria's size and economic means, the vehicle certainly exhibits impressively professional features, and presents a clear case of making the best possible use of every means available. In that regard, Transnistria is sure to continue surprising its tiny audience of foreign observers with the products of its indigenous military industry. In a sense, this marks a "reversion" to the late forties vintage Object 112 (25 dismounts carried), the father of all vehicles using this same basic chassis. What is strange is the armament configuration. It would make more sense (to me at least) to use a turret from a BTR/BRDM. That would mean at least eight BTR-60s or BTR-70s would lose their turret, I doubt that's worth it. The vehicle would suffer from a lack of vision with that kind of turret, it seems to lack provisions for proper viewports so the man's head sticking out is probably the best sensor suite it has. Could benefit from more armor though for the gunner, but it may be a moot point since the whole apc likely be penetrated by 7.62 AP at close range. I, for example, am relatively wealthy and yet I choose to live without shoes because I know of the damage wearing footwear can cause to the body. You may look at me and say I am poor and in need of help, whereas I could look at you in your relative wealth and say that you are the one who needs help because you wear shoes. Эта машина называется БТРГ-127 "Шмель"